After two engrossing sessions by Mr. Austin P M and Ms. Moushumi Bose, the first day of Crescita’13 is on full swing. The speaker of session 3, Mr. Raja Krishnamoorthy, the Director HRD of Talent Maximus India Pvt, Ltd., dealt a session on “Transformational leadership”. Transformational leadership builds upon the cornerstone of empowering employees and increasing their sense of ownership and thereby accountability. 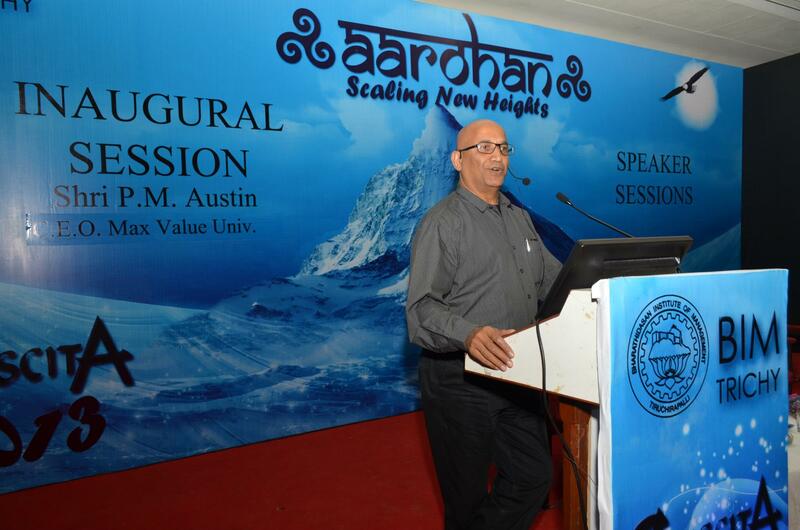 It enables the organisation to grow holistically and progressively; scaling new heights, and in so doing completely tunes in with the theme of Crescita 2013 – Aarohan. Mr. Raja Krishnamoorthy started off with Leadership – lack of it and dire need for concentration on it. He delivered not only an enlightening session but was also enthralling and enigmatic. He went on to talk about transformational leadership and its necessity in the present day world. The world around us has grown so tolerant to the loopholes and hecklers of the society, that people would rather sit and frown but will not get up and take the step for initiating the necessary change. He brought up relevant examples from the real life scenario with a tinge of humour, and thus kept the audience glued to his words while making his point about how the transformational leader should move beyond the obvious and be a creator in himself. He elaborated on the challenges plaguing the society namely rat race leading to anxiety, language of aggression (curse to the corporate world-language of warfare and destruction), limited perspectives and lack of leadership mindset. The bar must be set high for one to truly excel and succeed. He highlighted the AIM High Concept wherein “A” stands for Aligning with the competency based vision, “I” stands for Integrating with values and “M” stands for mastery in delivery which can be achieved through “Vairagya” (dispassionate determination). His lively stage presence and engaging examples kept the audience hanging on to his words. The session was not only enlightening but actually helped the budding managers to develop a refreshed and relevant outlook towards leadership. The negativity of the stressful lives that forms the norm of the present day life can be combated only with the light of positivity, a hope that transformational leadership can breathe into the society.